After adding a top layer of chocolate onto cooled layer of toffee, it doesn't stick well and falls off when handled; how can I improve this bond between toffee and chocolate? Someone else asked the question Why does the chocolate fall off of my homemade toffee? some time ago. One of the best suggestions was that you add the chocolate to the toffee while it is still hot. You don't even have to melt the chocolate first. Just pour the hot toffee into the tray and then immediately place the chocolate pieces for the top layer on top of the toffee. The heat will melt the chocolate and allow you to spread it evenly. Give that a try and let us know if it works for you. Comments for How do I prevent chocolate top layer from falling off English toffee lower layer? The best way to keep chocolate from falling off the toffee is to blot off the butter with a paper towel. 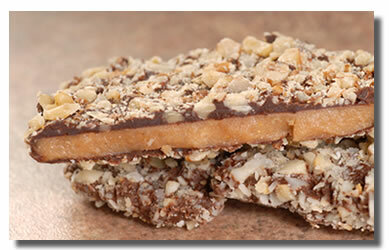 We have produced several tons of toffee over the past 5 years. We have had the issue of chocolate coming off of our toffee on several occasions. Our teqnique that we use now is as follows. We produce about 50 lbs at a time and pour onto a marble slab. After the toffee somewhat hardens we towel off any excess butter with paper towels. After the butter is removed we then rub our toffee down wwith cocoa powder, just enough to get rid of the sheen. Before applying the layer of chocolate we apply a small amount of chocolate and rub that in as well. After rubbing in the small amount of chocolate we then pour our chocolate on top and spread it. One thing to remember is do not put your warm toffee directly in to the refrigerator to cool. This causes the chocoate to cool much faster than the toffee itself. We put our toffee on bakers racks until it is close to room temperature. After that we transfer to our refrigerators. Good Luck, I hope this helps!! Thanks so very much for taking the time to share that tip about using the cocoa powder to help the chocolate adhere to the toffee. Great idea! I'm sure this will be helpful to many who come along looking for answers to this frustrating problem of the chocolate separating from the toffee. If you are unable to apply your chocolate while the toffee is still soft, you can lightly brush cocoa powder to your toffee, and then apply your chocolate. This will keep the chocolate from separating from your toffee after it is cooled. I don't have problems with my chocolate falling off of my toffee for the most part. I allow my toffee to cool and then I melt the chocolate in the microwave (I only use Hershey's milk chocolate) - and then I sprinkle on some almonds on top (that have been chopped in the food processor). I then put my toffee in the refrigerator and allow it to set. I live in a very warm climate (Arizona) and so it sets up better in the refrigerator. Once it is set, I then break it up and put in in bags and always put it back in the refrigerator. I have been making toffee for 30 years now and I can tell you butter makes a huge difference. Don't buy the store brand and whatever you do, don't buy Challenge butter. I usually buy Land of Lakes or Tillamook butter. Cheaper butter can cause your toffee to fail (worse case scenario) or to separate , while you are stirring it. I have used salted and unsalted butter and it doesn't seem to make a difference. I have made toffee twice in the past week. The first time it went great. I made it the same way except I might have used different butter. My recipe doesn't specify if I should use unsalted butter or regular butter. Last night my chocolate didn't stick to the toffee. I put the chocolate on as soon as I had the toffee spread out in the pan and didn't wait at all for it to cool. I used my candy thermometer to cook it only until it reached a hard crack and took it off the burner right away. Would the butter make the difference?